For years horse trainers and equine experts have sought new ways to tap into that which for many remains elusive: the ability to use the human body, and our often neglected power of intent, to explain to the horse what we want, as well as receive in and understand his answer. From the Feldenkrais Method(R), Alexander Technique, and yoga, to Tai Chi, Aikido, and other martial arts, we have used various areas of study seemingly unrelated to horses and riding to gain new insight as to how to achieve a soft, fluid connection with our equine partners. Now in this fascinating book, dancer and choreographer Paula Josa-Jones examines this age-old conundrum from a whole new angle, combining her two greatest passions: movement and horses. 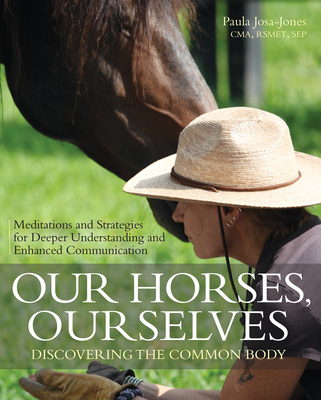 Through stories, strategies, and over 65 meditations and gentle exercises, Josa-Jones shows us how we can develop greater somatic awareness away from the horse, as well as how being with the horse can help this consciousness continue to evolve. The result is we not only have a closer, more intuitive connection with our horses, we are more trustworthy, more comfortable in our own skin, and better prepared to act with balance, sensitivity, and kindness in all our relationships. Paula Josa-Jones is a dancer, choreographer, and movement educator known for her visually rich, emotionally charged dance theater. Her work includes choreography for humans, as well as inter-species work with horses, dancers, and riders, and work in film and video. Josa-Jones has been called "one of the country's leading choreographic conceptualists" by The Boston Globe and The Village Voice describes her work as "powerful, eccentric, and surreal." Her dances have been produced in Russia, Europe, Mexico, and throughout the United States. Josa-Jones has taught in the dance programs at Tufts University, Boston University, and other colleges, universities, and dance festivals nationally and internationally. She is a Certified Laban Movement Analyst, Somatic Experiencing(R) practitioner, and a Registered Somatic Movement Educator and Therapist (RSMET). She is also a TTEAM (Tellington Touch Equine Awareness Method) practitioner. Josa-Jones is an avid horsewoman with a deep love and appreciation for her horse partners Amadeo, Capprichio, and Sanne. She works with individual clients and teaches workshops, focusing on the human-horse bond, and the wisdom of the moving body.